Super Vel's "Certified Select" training ammunition is re-manufactured from once fired US military brass casings, sourced directly from US military bases. Ideal for training, these cartridges are made using the same equipment with quality control as Super Vel's new manufactured rounds. Originally loaded by Super Vel ammunition in 1967 for the Navy seals for their MK22 Mod 0 suppressor. 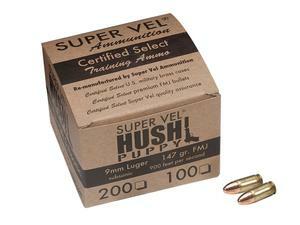 This re-introduced Hush Puppy ammunition is a subsonic 9mm load. Offers a muzzle velocity of 900 fps, this soft shooting, mild recoil round can be used for suppressed or unsuppressed applications. Has a power factor of 132 and its heavyweight projectile makes it ideal for 3-gun matches.